I am so excited to have Emily, my good friend from college, here to guest post! 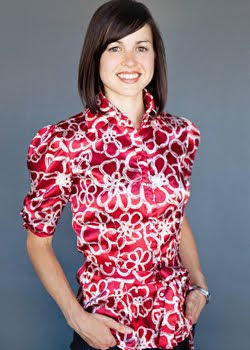 She is a Registered Dietitian and owner of Emily Fonnesbeck Nutrition Consulting. Previously she worked at The Biggest Loser Resort at Fitness Ridge in Utah, where she taught people from all over the world how to manage a healthy weight. She has a certificate in Adult Weight Management and is a Certified LEAP Therapist. She offers nutrition counseling to those seeking help in autoimmune diseases, food sensitivities (migraine, IBS, fibromyalgia, etc), child nutrition, diabetes care, heart disease, pregnancy nutrition, sports nutrition and athletic performance, digestive issues, vegetarian diets and general nutrition information. She counsels clients over the phone or in person. Visit Emily's website to learn more about her and the services she offers. Follow Emily on Facebook to get practical nutrition tips and Pinterest to see what healthy recipes she recommends. Hello Our Homemade Happiness readers! I am so happy to be guest posting today. Kendra has been a great friend and I admire her mission with this blog. There are so many food and environmental chemicals that can spell trouble for health and she has such great ideas on how to decrease our exposure. This post is inspired by Kendra’s husband’s battle with liver disease. The liver is the central detoxification organ in the body and certain foods can increase its effectiveness. I am passionate about decreasing inflammation in the body since inflammation is the precursor to any disease or illness. If the liver can detoxify chemicals and harmful substances, cells are protected from oxidative damage and inflammation is avoided. So today I hope to talk about foods and nutrients that will aid in detoxification by the liver and offer some easy recipes for some of those foods. The liver is the largest organ in your body and has several functions. It produces and stores bile, stores glycogen and rids your blood of waste, toxins and chemicals. Following are 5 essential foods and nutrients that will aid in this process. These vegetables over and above any other vegetable will do the most for the liver, inflammation and detoxification. They have 3 key compounds that trigger detoxification enzymes in the liver. Numerous studies have shown a protective effect against cell damage by increasing consumption of cruciferous vegetables. This will reduce your risk for cancer and heart disease. Examples include broccoli, cabbage, Brussels sprouts, cauliflower, bok choy, kale and spinach. Aim to consume at least one serving each day; ideally up to 2-3 cups! A word of caution - cruciferous vegetables have glucosinolates that break down to a compound called goitrin, which interferes with thyroid hormone production and could possibly lead to hypothyroidism. Cooking these vegetables will reduce the amounts of goitrin. These nutrients are great antioxidants that will aid in the liver’s ability to do its job. If your liver has adequate levels of these nutrients stored, it can more effectively neutralize the free radicals that are formed during detoxification. This means you avoid oxidative damage to the liver. Foods that are rich in vitamin C are citrus fruits, dark leafy greens and bell peppers. Foods rich in vitamin E are leafy greens, nuts and oils. Foods rich in selenium include fish, shellfish, meat, Brazil nuts, sunflower seeds, eggs, mushrooms and onions. Sulfur is part of glutathione, an antioxidant made in the body from amino acids that is a key factor in liver detoxification. Sulfur is found in onions, garlic and egg yolks. When the liver is under stress, fatty deposits can grow on the surface (visceral fat) leading to fatty liver. In addition to regular exercise, including 10 grams of soluble fiber a day can decrease visceral fat. Foods high in soluble fiber include beans, fruit, oats and barley. Aim for 2 servings of fruit, 1 serving of oats or barley and 1 serving of beans per day to get 10 grams. A serving is equivalent to ½ cup. Certain seasonings have been shown to have a powerful antioxidant effect on the body and the liver. Using more turmeric, cinnamon and curry powder will aid in maintaining a healthy liver. In addition to the above list, it is also important to focus on what may inhibit liver detoxification. Try to limit packaged, processed foods and high fat animal products. These foods are sources of trans fats, saturated fats, refined flours and refined sugars. Avoid caffeine, alcohol and tobacco as well. Try to eat organic foods, use natural household products (you're in the right place! ), and aim for 30 minutes of moderate to vigorous exercise each day. Here are three of my favorite “Liver Healthy” recipes. They incorporate quite a few of these nutrient rich foods! Preheat oven to 400 degrees F. Chop cauliflower and garlic. Toss together with oil and curry powder. Spread in single layer on tin-foil lined baking sheet. Bake for 30 minutes. Combine oat bran and milk in small saucepan. Place over medium heat and bring to a simmer. Once it starts to thicken, stir in vanilla, cinnamon and berries. When desired consistency is reached, remove from heat and allow to thicken in the warm pot, 1-2 minutes. Pour into bowl and top with nut butter or peanuts and extra fruit if desired. Combine all ingredients in food processor or high powered blender. Blend until combined. Serve with vegetables. To get more nutrition tips from Emily, you can follow her on Facebook and visit her website. Check out Emily on Pinterest to see what healthy recipes she has pinned for her clients! Great tips, thanks! I've been adding a teaspoon of cinnamon to my bowl of oatmeal every morning- good to know I'm on the right track. There is a considerable amount of solid, interesting information here, Emily. Thanks for "guesting" on Kendra's blog and for sharing your knowledge with us. I was surprised not to see anything about milk thistle mentioned. I have found it an extremely effective liver cleaner. In addition, diets that limit certain foods can cause nutritional deficiencies in teenagers who are still growing, including bone and muscle loss. Finally, starvation and extreme diets often lead to psychological disorders such as anorexia or bulimia, especially in girls, and can cause long-term damage to the body systems. Thanks. Nice post! I tend to forget that I even have a liver, so I am relieved to see that I am eating pretty well as far as these 5 things are concerned. Here are lots of ways to enjoy kale--it's not just a garnish! Many cultures have a recognizable cuisine, a specific set of cooking traditions using various spices or a combination of flavors unique to that culture, which evolves over time. Other differences include preferences and practices, the study of which is known as gastronomy. Thanks. Great list! And such a practical solution to a healthy liver! It's really something everyone can do! Oh I also forgot to add I'm visiting from Nature's Nurture blog. I always prefer to eat healthy foods which are really good for our body and this is a great list… if you really want a healthy liver try to follow this…. Health is vital to be wealthy as well. But most of us are not healthy due to our own behaviors, mostly the food behaviors. This post is precious. Liver is an important organ of our body. So it is important to keep your liver healthy. Vegetables and foods that contain sulfur are good for liver and must be taken regularly. I think avoiding junk foods and alcohol also keep your liver healthy. Very informative post. Without knowing the exact benefit of turmeric, cinnamon and curry powder I used to add a pinch from all three to my meals. Thanks for sharing.